uPVC Bow & Bay Windows will complete your Leicester home. A highly attractive addition to the living space, and an intelligent investment to which helps create the illusion of space. uPVC Bow & Bay Windows can be used as a lowered mantelpiece or easily converted into a seat. A few scatter cushions and you can create the place to sit, relax, and watch the world go by. It is important to point out that bow & bay windows are separate designs of double glazed windows. 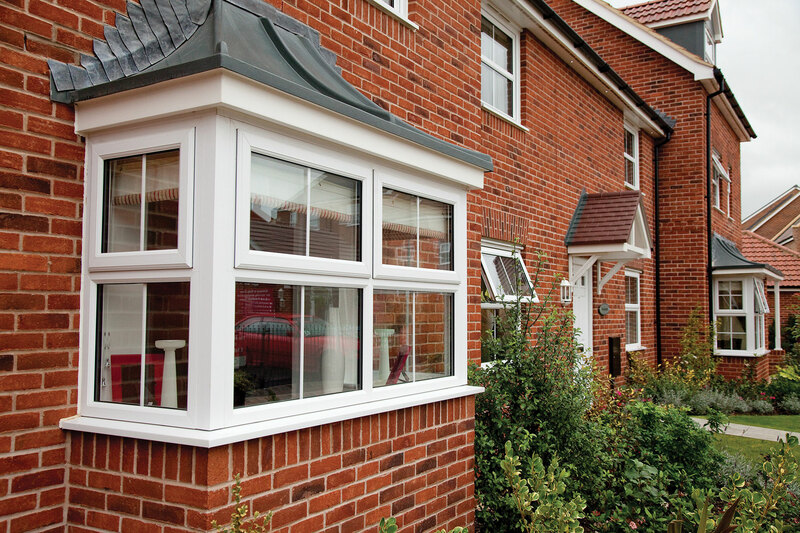 East Midlands Windows offer highly competitive prices for both styles. Bow windows hold a fluent, curved shape. This charming design is affectionately referred to as a compass design and successfully creates slightly unorthodox space, adding panoramic views to your front room. Bay windows are more of a definite, less dreamy style. They are in essence shaped much a like a box or rectangle. Out of the two, box windows add more space to your Leicester property. Perfect as a contemporary display unit, or a seat to recline and appreciate your garden. East Midlands Windows supply and fit uPVC Bow and Bay Windows around Coalville, Loughborough, Hinckley, Long Eaton, Wigston, Corby, Oakham, Melton Mowbray and Grantham. Why Choose This Style of Double Glazing? East Midlands Windows are proud to offer the most competitive online quotes for our complete range of bow & bay windows. We are totally committed to customer satisfaction and will not be beaten on price. Traditionally, uPVC bow & bay windows are constructed from three or six separate panels. Here at East Midlands Windows, we manufacture our bay and bow windows from the highest quality double glazed windows. Resulting in impressive levels of energy efficiency and security. We proudly supply and fit bay & bow windows that with an impressive U-rating of 1.2 and A+ WER rating. Both styles of windows are reinforced internally from high-quality steel. Secured with specifically designed multi-point locking systems. Our 100% lead free profiles are kinder to the environment. Both bay & bow windows will give you stunning views of your personal slice of Leicestershire. East Midlands Windows are solely dedicated to customer satisfaction. Just another reason why we offer an extensive range of colours and finishes. We pride ourselves in offering fantastic reductions on bay and bow windows. Our double glazing is designed to last a lifetime! Intelligent construction, heavily reducing the need for maintenance. Our installations team cleverly hide the bay poles within the window, so as to not distract from the authentic beauty of your Leicester home. Our sophisticated and advanced online quote engine allows you to develop free uPVC bow & bay window quotes in just two minutes. Once generated, you’ll have the ability to have direct access to your online quote at any time. If you would prefer to discuss your proposed project with one of our advisors, why not give us a call on 0800 1182201. Our friendly team of professionals will be more than happy to discuss your project with you. Alternatively, use our contact page to send an email.